Quarter- the complete upper part of a shoe upper above the vamp line. The quarter may be referred to as the "top" in case of high boots. It may also be split into several components parts such as foxing, plug, saddle. The pattern of the quarter is frequently the most important part of the design of the shoe. 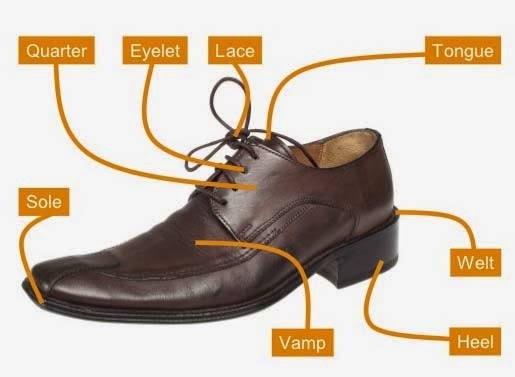 Roughing- the exposure and erection of the fibers of the material on the lasted-over margin of the upper and the corresponding edges of the outsole in order to provide a more grippable surface to be cemented for the purpose of sole attaching. Rough rounded- the outsole of a shoe after trimming or rounding off to the shape of the last. The crude outline made by the rough rounding machine is later perfected by edge trimming. Rubber- an elastomer capable of rapid elastic recovery after being stretched, specifically natural rubber which is the standard of comparison for elastomers. The term rubber may apply to any on of a large number of natural and synthetic elastomeric compounds which can be made in varying degrees of hardness and may also be expanded into cellular form of sponge or cushion. Rubber is commonly used for cemented or molded shoe bottoms as well as for separate soles and heels. Protective footwear is also made of rubber either slush molded or fabricated from sheeting or rubberized cloth.